Promising to remain “patient” on further hikes, Fed chairman Jerome Powell also said the US central bank may stop reducing its balancesheet – swollen four-fold to $4 trillion by ‘quantitative easing’ following the global financial crisis of a decade ago – sooner than previously expected. Dollar prices to buy gold in London’s wholesale market – centre of the world’s bullion trade – hit new 8-month highs at $1324 this morning. 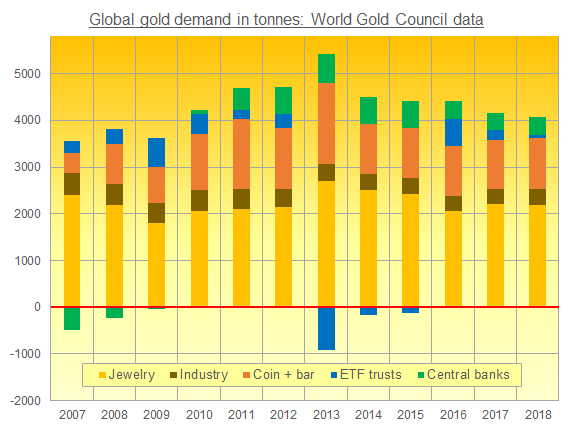 Without last year’s 73% rise in central-bank gold buying, total global demand for the metal would have barely reached 4,000 tonnes in 2018 according to Thursday’s new data, presented by the mining industry-backed World Gold Council. The second highest yearly total on record according to today’s release, that offset a drop in demand to buy gold-backed ETF trust fund products among money managers and other investors, and rescued full-year demand from what would have been the lowest total in a decade. “Economic uncertainty, slowdown [and the] US-China trade conflict supported investment flows” in late 2018, Reuters quotes the World Gold Council’s head of market intelligence, Alistair Hewitt. “The flip side is that it hit some elements of the market,” with Middle Eastern suffering from lower household confidence plus a rise in domestic gold prices thanks to weaker local currencies. “This dynamic is likely to run through 2019,” the WGC’s Hewitt adds. Platinum prices were more muted, recovering early January’s levels around $825 as sister metal palladium recovered half of the last fortnight’s 8.8% plunge from new all-time highs near $1440 per ounce. This publication is for education purposes only and should not be considered either general of personal advice. It does not consider any particular person’s investment objectives, financial situation or needs. Accordingly, no recommendation (expressed or implied) or other information contained in this report should be acted upon without the appropriateness of that information having regard to those factors. You should assess whether or not the information contained herein is appropriate to your individual financial circumstances and goals before making an investment decision, or seek the help the of a licensed financial adviser. Performance is historical, performance may vary, past performance is not necessarily indicative of future performance. This report was produced in conjunction with ABC Bullion NSW.